Upon researching this recipe, I tried to find out more of the history of Chickarina. Like some deep, dark government secret, there is no true history available online. What the hell? There were a few mentions of a “chickarina” jingle from way back in the day, including this one from a site dating it back to the 60s. 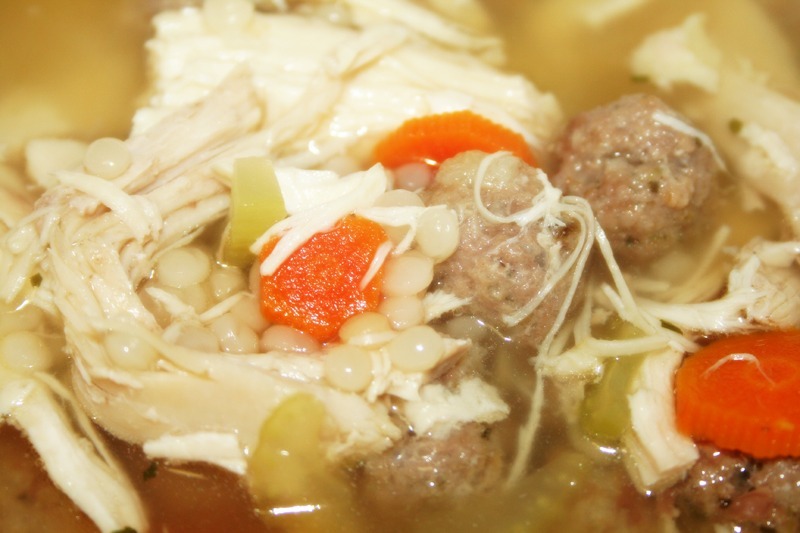 And a whole lot of people labeling it as Italian Wedding Soup, which it’s not. Though both dishes have mini meatballs and acini di pepe (mini pasta pearls – the name means “peppercorns” in Italian), the spinach or escarole is replaced with carrots and celery for a chicken soup + meatball experience. It’s excellent through and through, and a lovely riff on home cooked goodness. Though mired in mystery, I am dedicated to the joys of chickarina. Who doesn’t love a hearty bowl of chicken soup? Or a meatball? Or the two together in a melange of flavors? Bring it. If you can’t score the acini di pepe, you can also use Israeli couscous as a stand in. Just make sure to watch them as they cook in the stock as the couscous will start to disintegrate if you overcook it. 1 whole fryer, about 3-5 lbs. Begin by making your stock. In a pot or a pressure cooker, add a whole chicken, onion, parsley stems, parsnips, 2 carrots, 2 celery with tops, and bay leaves. If using a pressure cooker, add enough water to cover (at least 4 quarts), cook on high pressure for 40 minutes and then bring back to pressure naturally. If using a stock pot, add 5-6 quarts of water, bring to a boil and simmer chicken until cooked through, about 2 hours. Strain liquid and set aside. Separate skin, bones and vegetables from chicken. Shred the meat and set aside. You can save the skin, bones and veggies for another pot of stock, or you can discard. Now, get to making the meatballs. Preheat the oven to 400°. With a standing mixer or with your hands, mix the ground beef, garlic powder, parsley, salt, pepper, oregano, egg, bread crumbs and cheese. Make sure not to overmix. With excruciating patience, use a 1/4 teaspoon to form mini meatballs. Line a baking sheet with foil and place all of the meatballs on the sheet. Bake for 10 minutes. Set aside. Put 4 quarts of stock in a pot with the meatballs, sliced celery and carrot coins. Bring to a boil and then add your acini di pepe. Cook for about nine minutes, or until pasta pearls are tender. In the last minute of cooking, add the chicken meat to the pot. Serve with chopped parsley. hi – unless I am missing it – how much water do you use for the stock? This is my favorite Progresso soup. All out local grocery stores stopped carrying it. I can only find it at CVS and it's very expensive! I can't wait to try your recipe. Whoops! That'd be important to mention, right? You want about 4 quarts of stock for one pot of chickarina. If you are making your stock from scratch in a pot, you'll want to use about 5-6 quarts of water as some of the stock will evaporate as it simmers away (and if you have any extra, freeze for another recipe). If you are using a pressure cooker, try to use closer to 4 quarts of water (or enough to barely cover the chicken and veggies) as you'll end up with a lot less evaporation in the closed pot. Have fun making this! It certainly is a lot cheaper than buying it buy the can. I used to get a subscription to Amazon.com's grocery service to get it a little cheaper, and it was very expensive.